It’s a good a question, even when not delivered in a strained impersonation of a Scouse youth. 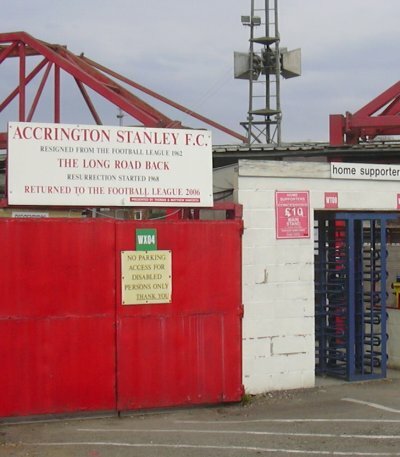 The League Two team now known as Accrington Stanley are technically not the same club as Accrington FC, one of the founding members of the Football League, nor are they Stanley Villa, from whom their distinctively English name comes from. Only technically, though. A boom town of the late 1800s, attracting the kind of wealthy entrepreneurs who could afford to do frivolous things like start football clubs, Accrington spawned numerous teams, with such wonderful names as Grasshoppers, Accrington Remnants and Bell’s Temperance. Among these, Accrington FC and Stanley Villa – named for Stanley Street and the local tavern at which they were founded, the Stanley Arms – were two of the first, dating back to the 1870s. For many years, Accrington lived in the footballing shadow of nearby Blackburn, home of Olympic and Rovers, and Darwen FC. These Lancashire teams are best known for leading Northern football’s uprising against the London elite, but when the Football League was created in 1888, it gave the handful of clubs at the initial meetingFN2 the chance to put one over their local rivals and establish themselves as the premier clubs of their respective towns. The League’s main purpose was to provide clubs with regular fixtures and therefore regular income, which in turn would provide wages for the newly sanctioned professional players (see ‘I Predict A Riot: how Preston’s Scotch professors upturned football’s social hierarchy’). Accrington had been one of the early adopters of professionalism and were expelled from the FA in November 1883 for this very reason, so perhaps the likes of Preston’s William Sudell and Aston Villa’s William McGregor – two of early football’s class warriors/mercenary upstarts (depending on your point of view) – saw them as kindred spirits and extended their invitation out of empathy. The upshot was that, for all their quality and history, Blackburn Olympic and Darwen FC were not founder League members, but Accrington were. This status perhaps gave Accrington FC ideas above their station. The 1892/93 season was the first to include a Second Division after the Football League and rival Football Alliance merged. That year, Accrington finished second from bottom (out of 16) in the top flight and were forced into the ignominious ordeal of a play-off with Sheffield United, runners-up in the new division. The match was staged at Nottingham’s Trent Bridge and finished 1-0 to United, meaning the Yorkshiremen would be promoted and the Lancashire club relegated. However, rather than bear this dishonour, Accrington instead huffily resigned from the League altogether. As the Football League grew in members and popularity, Accrington struggled along, with pride intact but their finances in tatters, until January 14, 1896, when they were beaten 12-0 by Darwen in the Lancashire Senior Cup.FN3 Shortly after this disgrace, the club whimpered out of existence. This left Stanley Villa, renamed Accrington Stanley in 1884, free to assume the mantle, although it would be another three decades before the town saw League football again – and then it would be under a very dark cloud. The 1920s should have been a happy age for the club, with their new ground at Peel Park open in 1919 and their high standing in the semi-professional Lancashire Combination (of which they were two-time champions) qualifying them for the new Football League Division Three North  in the 1921/22 season. In that first year they finished an impressive fifth. But the town of Accrington was still in mourning. British school children remember the 11th Battalion, East Lancashire Regiment as simply the ‘Accrington Pals’. On July 1, 1916, the first day of the Battle of the Somme, the Pals were ordered to attack the village of Serre, their first action in combat. Of the 720 volunteer men from Accrington and the surrounding area, 235 were dead within half an hour, with hundreds more injured or captured. In his tender portrait of 20th century Britain, Hope & Glory, Stuart Maconie suggests the town has ‘never fully emerged from the shadow of that day’. Indeed, fans arriving at Peel Park for the remainder of the club’s history would have walked past trenches dug in the surrounding land by the Pals during their rudimentary training, a haunting reminder of the town’s loss. Accrington Stanley remained in Division Three North until 1958 when it became just Division Three . During the 1950s, they had been runners-up twice (at a time when only the top team got promoted) but had also been saved from relegation, because there was simply nowhere to be relegated to, on several occasions. This changed in 1958 with the North and South Divisions  reorganised into Divisions Three and Four . In 1960, the second year of this new structure, Stanley were relegated to the fourth tier. Two years later they dropped out of the Football League altogether and had to re-enter the Lancashire Combination, Division Two no less. Promotion and immediate relegation in successive seasons attested to a club in turmoil and by 1965 Stanley were in utter financial ruin, resigning from the Combination and folding completely a year later. Entering the Lancashire Combination for a third time, it took the new Stanley 40 years to reach the Football League again.FN5 Their nine-years-and-counting stint in League Two  has been as unremarkable as their previous spell on the Football League’s bottom rung, the highlight arguably being the 1-0 victory over Nottingham Forest in Stanley’s first ever League Cup match. But for the people of Accrington, particularly those old enough to remember the Peel Park days, just having a Football League club is a source of great pride. Signs around the ground proclaim it ‘The Club That Wouldn’t Die’. Search Twitter for ‘Accrington Stanley’ and you’ll find that fans of other clubs are less reverent – struggling League One teams see a potential away trip to Accrington as the living embodiment of the horror that is relegation, while a poor performance by a Premier League side will see them compared unfavourably to Stanley. All this is probably Ian Rush’s fault, or at least the Milk Marketing Board who famously established Accrington as the archetype of hopeless clubs in his name. The club themselves take this in good spirit – ‘Milk advert references expected’, their Twitter bio states with mock weariness. Accrington Stanley were probably only chosen for the advert because their name sounds particularly comic in Liverpudlian tones. The meme stuck, but inadvertently gained the club what Maconie calls a ‘warm sepia generalised affection’. It’s certainly true that they are part of football folklore, if not major figures in its history. One can’t quite imagine them in the upper reaches of the Football League, but one also hopes that – like a sturdy ‘Nori’ brick – they will continue to endure. FN2Aston Villa, Blackburn Rovers, Bolton Wanderers, Preston North End, Stoke and West Bromwich Albion. FN3The Lancashire County Football Association Cup was first contested in the 1879/80 season. Accrington FC won the competition three times before going out of existence. Remarkably the competition is still going, with top clubs entering teams as part of their under-21s’ pre-season schedule. In August 2012, the town of Accrington was once again represented in the final when Stanley lost 4-0 to Manchester United. FN4Trivia fans will be delighted to read that the meeting to form the new club was apparently called by someone named Stanley Wotherington. FN5Their first game, on August 5, 2006, was against Chester City, a team who ironically would go out of business themselves in 2010.